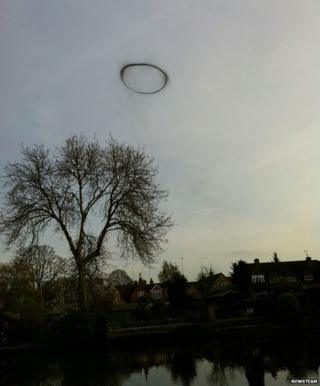 A video of a mysterious black ring in the sky over Leamington Spa left people scratching their heads, and prompted a wave of speculation, writes Tom de Castella. The ring was reportedly captured by a 16-year-old schoolgirl with her smartphone after she played tennis with her mother. The ring - which appeared to be close to Warwick Castle - remained in the sky for around three minutes before vanishing, it has been reported. Several different theories were put forward as to what the ring could be. Some people speculated whether it would be possible to fake the video. In theory you can fake most things, says Iain McArthur, an expert at Audio Video Forensics. For instance, the footage wobbles. You can fake this handheld look. But other elements seem to ring true, he says. There's a "blob" on the top right and top left of the ring, suggesting movement - "something organic", he says. It's not clear how far away the ring is from the smartphone. The video footage is blurred at the sides. But he doesn't think it is suspicious. "Initially it doesn't look like it's faked." It's not like other video of unexplained sightings - in particular the hazy edges to the black circle. "The blurring element is different from any UFO footage I've seen," McArthur says. Other people thought it might have been a strange weather phenomenon. But that's not so, according to the Met Office. "There's no meteorological reason why it's happened. And there was nothing unusual happening in Leamington Spa that day, we've checked," a Met Office spokeswoman says. The shape is said to have remained in the sky for three minutes. And it's very rare that a cloud circle "that perfect" would remain without being blown away at that height. So could it have been a swarm of insects? Some insects do gather in groups like this at certain times of year, says Frederic Tripet, an entomologist at Keele University. The fuzziness of the black outline almost looks like insects leaving and joining the circle. One of the images has a very faint line curving up from below which might be seen as insects arriving and departing, he believes. Another has what looks like a fly in the foreground, he says. "When the winter is mild you can expect population explosions of some insects. They may be mating in that aggregation. Usually mating is not done as high [or] in ring formation." If not insects, then could it have been birds? A strange black cloud was captured over Leamington last year. It was a flock of starlings. Birds are known to fly in tight formations, such as a V-shape. Could this ring also have been starlings? The answer is no, says Richard James, wildlife adviser at the Royal Society for the Protection of Birds. "Starlings and waders can form fluid shapes. But they won't form a shape like this." You sometimes get a small number of buzzards circling around a thermal but it wouldn't resemble the Leamington ring. They would not be as close together. They're likely to be individually visible rather than an amorphous black mass, he says. "It's certainly not birds," he concludes. The eventual answer came in the middle of Tuesday afternoon when a statement from Warwick Castle confirmed that they had been testing fireworks. A Warwick Castle spokesman said they had been trying out "fire effects" to go with the daily firing of the Trebuchet Fireball - a giant catapult. "We've seen a number of different effects, including the vortex images that have been reported," the spokesman said. "As yet we don't know what causes the phenomenon but it's certainly a spooky spectacle."